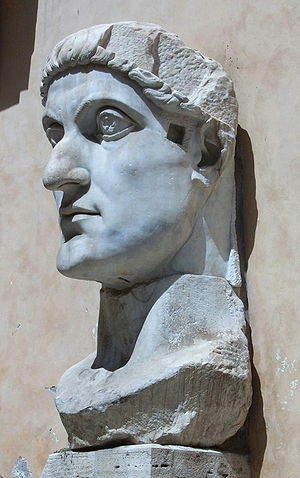 Could you give an example of some commonly asserted “polemical nonsense being spouted these days about Constantine?” I get that there is more to the story than Constantine, and that he isn’t the lone Villain responsible for developing a sort of pro-War, nationalist Christianity. But doesn’t he play his part? Is Yoder being unfair? As for the dreaded “Constantinianism,” I don’t buy that it existed, at least in the form I understand has been described by Yoder. Leithart acknowledges that Yoder “provided the most sophisticated and systematic treatment” of this concept (that after Constantine came “a heretical mindset and set of habits that have distorted Christian faith since (at least) the fourth century”). But there was, I join Leithart in believing, no fourth-century “fall” of the church attributable to Constantine. Of course, I know where you stand on these things, and why the model of “Constantinianization” appeals to you. The question is not whether the model is appealing or communicates partial truths. The question is whether it stands up to scrutiny: can we verify historically that such a “fall” in fact took place? Leithart’s answer, and my strong suspicion, is that it we cannot, and that we only believe this scenario because it serves certain of our (political) agendas–in a way not dissimilar to Wilson-Hartgrove’s (and other new monastics’) portrayal of “old monasticism”–as you and I discussed when I posted recently on that portrayal. Says Leithart, “Yoder gets the fourth century wrong in many particulars, and this distorts his entire reading of church history, which is a hinge of his theological project.” I haven’t seen Leithart’s evidence for this yet, but I have to say that it rings true to me. We have today gotten beyond polemical (and wildly incorrect) Roman Catholic and magisterial Protestant renderings of church history–especially on the history of the Reformation, but also on the early church. Why are we still crediting polemical (and incorrect) Anabaptist renderings of church history? The historiographical horse is a delicate animal: she cannot flourish when harnessed to the polemical war machine. It throws her all out of stride and wounds her true beauties. This entry was posted in Resources for Radical Living and tagged Constantine I, Constantinianization, Early Christianity, historiography, John Howard Yoder, Mark Van Steenwyk, Peter Leithart, polemicism, Roman Emperor. Bookmark the permalink. B.C. (Before Constantine) the people called “Christians” never became soldiers. After Constantine, you couldn’t be in the Roman army UNLESS you were a Christian. The way I see it, that’s a definite step downward. While I agree that Constantine is not the whole story of the development of Christendom. In my understanding, he is but one step – a formative one – in a longer slide toward Christendom (which is not the same as saying “perfect before/all bad after.” I think we need to at least characterize this shift as my friend Alan Kreider does from the imperial accommodation of Christianity (Constantine) to imperial adoption of Christianity (Theodosius). There is a difference between declaring religious tolerance of Christianity and making it the Imperial religion. David, there certainly is a difference. One part of that difference was the temptation, not always resisted, to use the arm of the state to persecute adherents of pagan religions–not a happy chapter in our history. By the way, I have been interested and inspired by Alan’s work on the “lifestyle evangelism” mode of the early Christians–certainly something that resonates with the best of Anabaptism. I’d be happier if scholars such as Alan didn’t feel quite so free to dismiss the important work of the definition of orthodox belief, but that doesn’t mean I can’t learn from them. A second thought: are we really so in love with the idea of Christianity as a martyr faith that we would have preferred that that “imperial accommodation” never have taken place? That, in other words, Christians were still being killed for their faith in every world culture (as certainly continues to happen in some)? Quite apart from the ability of an un-persecuted faith to propagate itself worldwide in so many ways, I just can’t see that the tremendous advances in the sciences, arts, health & healing (the development of the hospital), and so much else that we take for granted today would have emerged from a marginalized, persecuted church. But I am a “Christ above culture” guy, not a “Christ against culture” guy, on H. R. Niebuhr’s Christ-and-culture map (which I buy despite the critique of Hauerwas & Willimon). I would fall into the camp of Robert Louis Wilken, who talks about, for example, the “Christianization of Hellenism” rather than the “Hellenization of Christianity.” Or the camp of Lamin Sanneh, who points out that Christianity always, when it first enters a culture, both revises and relativizes various aspects of that culture–as a part of the incarnational principle of “translatability.” I’m not ready to give up on the common grace, the general revelation, the widespread action of the Logos even in arenas and cultures that do not acknowledge Christ, and so forth. So to me, the “imperial accommodation” has turned out on balance to be a positive thing. What Theodosius did is a separate issue–though of course it wouldn’t have happened without Constantine. Neither, however, would the freedom of religion in the modern American Empire–including the ability of Anabaptists to live out their non-violent convictions through the options of conscientious objection, etc. Thank you for an interesting overview of a book I will need to read. However, my own view of Constantine as the symbol (if not the source) of the reversal of the anti-imperial Gospel comes not from Yoder but from such esteemed historians as Hal Drake, in his “Constantine and the Bishops.” How does Leithart deal with Drake, Stevenson and others who have shown Constantine’s imperial and anti-gospel tendencies? Wes, thanks for alerting me to Drake and Stevenson. Once I’ve read Leithart, I’ll try to remember to come back to this post and your response, and to reply.